Just five months after stepping off the court in her final basketball game as a Spartan, Ali Jones, class of 2016, walked into her dream job as the Fair Haven Union High School Activities Director. The Poultney, VT native graduated with a Bachelor of Science in Sport Management and was also a two-year starter for the Spartans. Jones credits her student-athlete experience with preparing her for her professional endeavors and providing her with the skills necessary to be successful. “Being a student-athlete helped me get a job in the field that I got my degree in. I increased my organizational skills as well as my time management skills,” she said. Jones said she takes great pride in having had the privilege to call herself a Spartan in her four years at Castleton. While wearing Spartan green, Jones became very comfortable climbing ladders to cut down championship nets and said her greatest experience was advancing to the Sweet 16 of the NCAA Tournament with the most winning team in Castleton’s history in her sophomore season. “It still gives me chills thinking about it,” she said. In her four years on the hardwood, Jones claimed an ECAC Championship and was a two-time NAC Champion. However, she said it wasn’t about the accolades, but rather the relationships formed that made her experience at Castleton so rewarding. Off the court, Jones excelled in the classroom as well and was named to the NAC All-Academic Team. 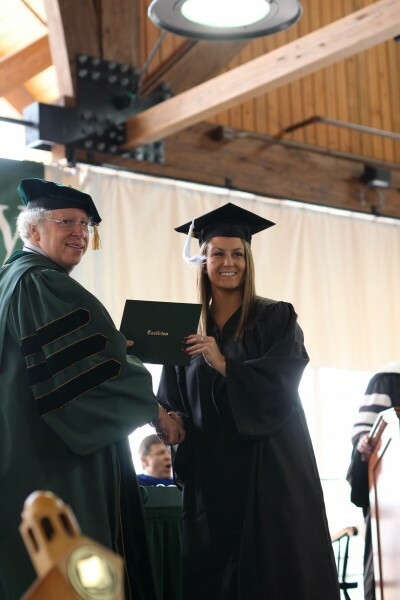 She encourages current student-athletes to put their greatest effort into every opportunity Castleton has to offer. “Being an athlete at Castleton is a once in a lifetime chance. Take advantage of it and enjoy it while you can,” she said.